Join us for our monthly tastings at Liberty Harbor. 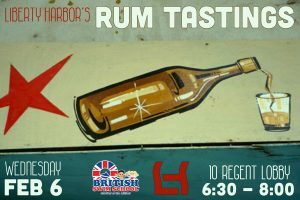 Join us this month to enjoy and explore Rums. British Swim School will be holding a tabling event too, with giveaways for the kids, so stop by and visit! British Swim School is Hudson County’s premium swim lesson provider. We offer lessons in small groups (4 kids: 1 instructor) in the heated indoor pool at PS16, conveniently located in Paulus Hook (96 Sussex @ Washington). With other locations in Weehawken, Secaucus, and Bayonne. https://britishswimschool.com/hudsonwaterfront/ or call us at (201) 676 3630. Come join the hundreds of parents who have already enrolled their kids in lessons with us at PS16!